Martin Schwalb received his training at the Staatliche Fachschule für Geigenbau in Mittenwald, Germany. 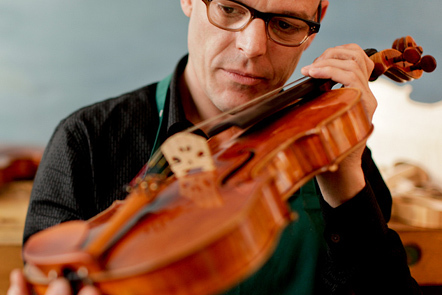 After obtaining his degree in spring of 1992, he spent years as a journeyman with both Master Violin Makers Konrad Stoll, Haldenwang, as well as Markus Lützel, from Würzburg. Both laid the foundation for Martin’s future passion for building and restoring instruments. After obtaining his Master Violin Maker’s Diploma in Hamburg in 1998, he subsequently took a position at the international workshop of Machold Rare Violins in New York, as well as in Vienna, Austria. There his craftsmanship further evolved, particularly in the areas of restoration and tonal configuration. Working with an impressive array of old Italian Master violins helped shape his stylistic philosophy. In addition, his collaborations with renowned instrumentalists such as Julian Rachlin, Nikolaj Znaider, and Günter Pichler have became inspiring and defining factors in his career. In 2006, Martin founded his own workshop in Vienna, Austria. His focus has since been on building new instruments, mainly violins, and violas, as well as cellos. His models are based on the classic Cremonese and Italian school of violin making. Martin’s violins are appreciated for their exceptional tonal and playing quality, as well as great power of projection and radiance. Martin Schwalb is an avid muscian himself. He plays both the violin and viola, in a number of orchestras and chamber ensembles.